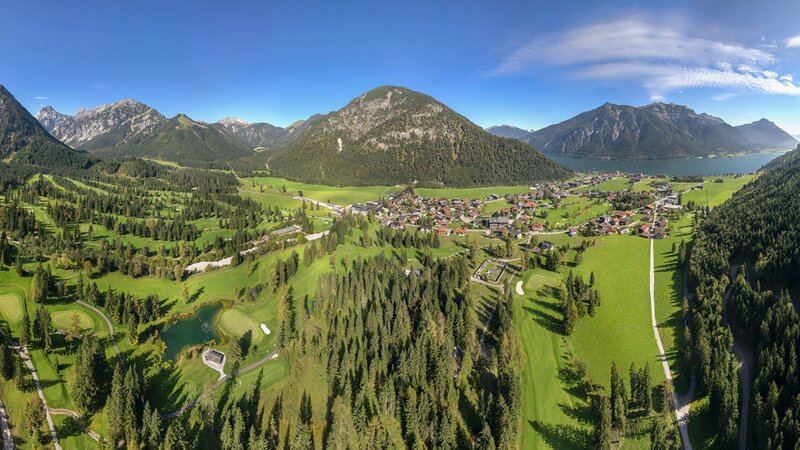 Nestled beautifully amongst the backdrop of the Karwendel massif, the Golf Club Achensee enjoys a prime setting in Pertisau. The teeing ground of the first hole is located right in the middle of the village. The course continues on gently undulating greens in the Nature Park Karwendel. On the course, golfers will find excellent facilities such as numerous drinking water fountains with Alpine spring water, public toilets and storm shelters. The Golf Club features a top-notch restaurant, a newly built covered driving range, extensive practice greens and a pro shop with a well-stocked choice of equipment and clothing from all the top name brands. The village of Pertisau offers everything you need for enjoyable golf holidays. Golfers will find a range of high-quality accommodation, numerous leisure facilities as well as a general practitioner just a few minutes away. Come and see for yourself!